African Dance is not just movement for movements' sake but the embodiment of poetry, history, community and transformation. Immerse yourself in the rhythms and traditions of West Africa. Bare feet and comfortable clothing are the only pre-requisites! Live Percussion. Continuing students will be able to progress at a faster pace. Higher jumps! Faster pulses! Live Percussion. "I am touched by Africa. She lives through my spirited self. She has spoken to me. I move into myself by being myself." Jump, shimmy, turn and swing in an exciting new West African and Jazz rhythm and dance class! Some live percussion to accompany the dancing. Immerse baby and you in the rhythms of West Africa. All levels are welcome. Wear comfortable clothes and a sling, wrap, snuggly or backpack to carry baby. Join MoonDance drummers for traditional West African rhythm and technique. Experience the benefits of hand drumming: increased clarity and focus, community building, joy and release. Love making music AND moving to it? In this class you don't have to choose. Play rhythms on the West African bass drum (doundoun) with sticks, while simultaneously carrying out dance moves! Even if you've never drummed or danced before, Mohamed makes it easy to follow. Treat yourself to a challenging new experience! Come laugh, dance, and drum in this lively class while enjoying a traditional cultural experience. Join Danny Mosquera for an exploration of contemporary Afro-Colombian dance. Danny's fast-paced, lively style will keep a smile on your face! Find freedom of movement through strength and release. Using yoga as the foundation for an exploration of music and movement, the class builds on the body's natural abilities. No previous experience required. This class is for beginners and also for those who have had a bit of dance. Ballet has been 400 years in the making and the calmness and rightness of its 'barre' bringing alignment and gentle foot and body training, the poetry and grace of its adagio time in the centre, the 'dance love' enjoyment of the step section and the sheer power and exhilaration of the jumps are the elements of a ballet class. Bellydance, W. African, Bhangra, Yoga & Pilates in one seamless fitness class w/GREAT MUSIC. Learn the basics of conversing in French in a fun, creative & supportive environment. Watch out! Kids have a lot to say and this class will provide strategies for those ideas to evolve into engaging performance pieces. Chris will be the ringleader for this fun and exciting class that will draw on elements such as movement, text and new technologies. Kids discover the basics of rhythm and dance in a fun and high-energy class. Includes story, song, poetry, role play, improvisation and percussion. Influenced by jazz, African and Latin movements. Classes for 3-11 olds. This is a class that focuses on alignment and core to bring all parts of the body into the proper balance, relieving the stresses that occur when something is 'out of whack'. At the same time the serenity, the joy and then the sheer fun of dance are integral in the class for body and soul heal each other, bring freedom of body, peace of mind and 'joie de vivre'. The class uses music from many genres and countries. Dancers not only love to dance, they Have to dance—for their love of life and for their sense of who they are. This class will be shared by various teachers to give a great dance class of various styles to those who must (for the state of their happiness) ...dance. This class gives a general dance training (elements of modern, ballet and jazz) to set things going. Non verbal theatre elements will be introduced in a variety of ways. In addition a musical theatre piece will be taught to bring the elements of stage and performance to the class. A fun alive class! Fun, funky choreography is the foundation of this class. Includes "clean" age-appropriate music, and opportunities for collaborative choreography. Through an in-depth exploration of single asanas, come to see the power and meaning of yoga: UNITY. Class includes warm-up, deep exploration of a yoga "pose" (asana), including journaling and time for reflection, and a final meditation. Lynn is not a certified yoga instructor. She has been practicing yoga all her life. (Her Mom is a yogini, and Lynn grew up doing yoga in the living room, and occasionally attending classes with her Mom. As an adult she has always had a regular practice and studied with many fabulous instructors.) She feels that her extensive dance knowledge and teaching experience allow her to effectively and safely offer this class. This method of journaling yoga has been a transformative and deepening experience for Lynn, and she is looking forward to sharing this. For local certified instructors, please see two of Lynn's favourites: Nicola Cusi and Robin Massey. Experience the magic of Spanish Romany (gypsy) tradition through the artful movements of flamenco dance. Learn 4- and 12- count rhythm structures, hand-clapping (palmas), footwork and upper-body styling. Character shoes (preferable) or bare feet. The traditional dances of Morocco, Tunisia, and upper Egypt offer an ancient method for developing co-ordination and strengthening core muscles, while integrating posture and balance. Classes include deep stretches. Taught by a professional dancer with forty years experience. This is not a meditation class or workshop, but rather a space for you to gather in community to meditate and share your bliss and peace. It has been noted that people find it easier to meditate in a group, and with the structure of the time set aside for that. Our actual time meditating will be approximately 1/2 hour. You do not need to sit on the floor: you can sit on a chair, or lie down, or have a moving meditation. There are no "rules" that need be adhered to! This is time for you to deepen to connect to the Source. Jung-Ah teaches a centre class that has challenging choreography, physicality, focus awareness, combinations across floor, stretching and most importantly charged with a love of dance and full of energy. The class is intended to build the foundations of technique in combinations that provide an exploration of movement and a sense of dance. The class will combine her own movement vocabulary as well. This class meets the physical and the spiritual aspects of Self by deepening an internal connection to the sacred flow. Designed to cultivate strength in both your body and mind while increasing overall well-being. Groove to beats from around the world as you cultivate flexibility of body & spirit. Take time out for you in this relaxed and positive class. Lori teaches conceptually ensuring that young children are gaining an appreciation and love of movement. A new dance concept is explored each week and children improvise to explore this new idea under Lori's guidance. The warm-up includes the BrainDance (copyright Anne Green Gilbert), which is a valuable support to healthy brain development in young children. Lori has taught extensively in daycares in the Victoria area. Your toddler will gain a love of dancing together with family! They will learn the basics of the BrainDance warm-up and begin exploring dance concepts in simple forms. We will follow the childrens' lead as we explore their ideas of time,space and energy. Your child will expand their love of dance by engaging in exciting dance improvisations where they play with time, force and energy. An encouraging class to discover what they can do when they are invited to explore their ideas! We will bring visual art and rhythm into the dance class. Your children will be designing their own dances! 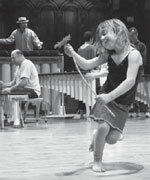 Explore rhythmic play and creative dance with your child in a fun and relaxed atmosphere! Includes song, story, percussion, and role play. For children aged 1 to 3 years with a caregiver participating. An hour to focus on feeling and emphasis on easing. The practice of Yin Yoga in which asanas (postures) are held for sustained periods of time to encourage practitioners to explore possibilities, cultivate compassion and refine awareness. Yoga Shimmy is a fun fusion of Hatha Yoga and introductory to beginner levels of Middle Eastern Dance (aka Belly Dance). This blend is provided to introduce you to the basics of belly dance while enjoying the benefits of a connected body, mind and spirit that yoga provides (not to mention more flexible muscles!). Our casual format takes us through a gentle yoga warm up and stretch, fun belly dance movements and choreographies followed by a yummy yoga cool down and guided relaxation. Classes are open to all levels and no prior experience in either yoga, dance or bellydance is required! Bring a yoga mat, blanket and water if you've got 'em! Classes are ongoing so please feel free to email Robin at at any time to join in the fun. 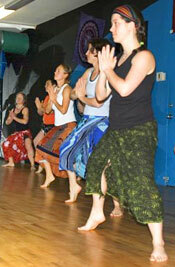 Private lessons are also available (in Drumming, Stretch & Strength, West African, and Ballet). Workshops are available in any of these disciplines. GIFT CERTIFICATES AVAILABLE for Birthdays, Christmas, or other Special Occasions!